Washington's Grand Coulee is an ice-age channel that carried the Columbia River when ice dammed its main course. Grand Coulee was long recognized as an ideal place to store Columbia River water to irrigate the arid but fertile Columbia Basin. A dam was proposed as early as 1903, but opposition by Spokane private power interests and the cost of the dam delayed design and construction until the administration of Pres. Franklin D. Roosevelt. Roosevelt, a public power advocate, used the Grand Coulee Dam project to help put the unemployed to work. The result was the world's largest man-made structure, and also the world's largest power plant, costing more than $163 million and the lives of at least 72 workers. The dam powered production of aluminum, atomic weapons, shipbuilding, and much more, contributing mightily to America's victory in World War II. Postwar developments provided irrigation for 700,000 acres of farmland. Author Ray Bottenberg is a registered professional engineer and a student of Pacific Northwest history. 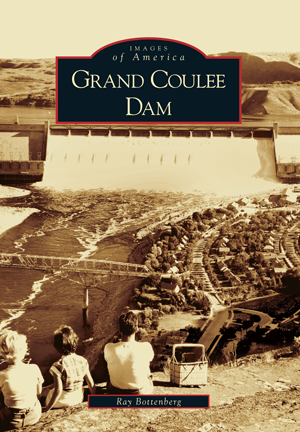 In this volume, he tells the story of Washington's Grand Coulee Dam through photographs gathered from such sources as the National Archives, the Washington State Archives, dam worker Ray Hobson, and several private collections, including his own.